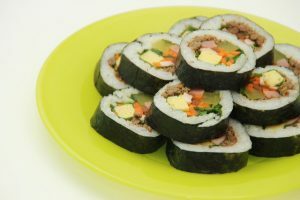 Gimbap (김밥, in the Revised Romanization of Korean) or kimbap (in McCune–Reischauer romanization) is a Korean dish made of rice and other ingredients rolled up in dried seaweed. The Korean name 김밥 gimbap literally means ‘laver rice’, from 김 gim [ɡ̊iːm] (‘laver, a type of edible seaweed’) and 밥 bap [b̥ap] (‘cooked rice’). Until recently, the only recognized standard pronunciation of 김밥 gimbap was [ɡ̊iːm.bap].  Standard Korean is theoretically based on the contemporary speech used in Seoul by refined folk, and according to that definition, [ɡ̊iːm.bap] was the traditional pronunciation. But the Great Dictionary of Standard Korean (표준국어대사전 Pyojun Gugeo Daesajeon), published on line by the National Institute of the Korean Language and the de facto arbiter of Standard Korean, includes in its list of revisions for the 3rd quarter of 2016 an additional pronunciation for 김밥 gimbap: [ɡ̊iːm.bap] remains the standard pronunciation, but it is no longer the only one, as [ɡ̊iːm.pap] (i.e. pronounced as if written 김빱 gimppap) is also recognized. Whether it has always been the case or is a more recent phenomenon, nowadays there certainly are a lot of people who pronounce the name of this dish as [ɡ̊im.pap] (in contemporary speech, vowel length is no longer distinctive for most Koreans, although dictionaries continue to mark long vowels). This is the result of a phenomenon called ‘sai-sori‘ in Korean (사잇소리 saitsori [z̥ʰa.is.so.ɾi]) that affects compound nouns. The name of the phenomenon itself is an example of this, as it is a compound of 사이 sai [z̥ʰa.i] (‘between, gap’) and 소리 sori [z̥ʰo.ɾi] (‘sound’). When sai-sori is inserted in the compound noun, the initial consonant ㄱ g, ㄷ d, ㅂ b, ㅅ s, and ㅈ j of the second element becomes fortis ㄲ k, ㄸ tt, ㅃ pp, ㅆ ss, and ㅉ jj in pronunciation. So instead of *사이소리 *saisori [z̥ʰa.i.z̥ʰo.ɾi], you have 사잇소리 saitsori [z̥ʰa.is.so.ɾi] where the hangul letter siot ㅅ s, called the 사이시옷 saisiot (‘in-between siot‘), is attached to the end of the first element. This in-between siot may be pronounced as [t] in a sort of spelling pronunciation, but the primary function is to mark the fortition of the following consonant. In Korean, the sequence [[ts]] deafficates and becomes geminate [ss] anyway, so 사잇소리 saitsori is not a good example of this. A better one would be 냇가 naetga (‘edge of a stream’) from 내 nae [nɛː] (‘stream’) and 가 ga [ɡ̊a] (‘edge’), which would usually be pronounced [nɛːk.ka] but could be [nɛːt.ka] in a spelling-influenced pronunciation. Fortition of the initial consonant of the following element is not the only way sai-sori can surface. In 나뭇잎 namunnip [na.mun.nip] (‘tree leaf’) from 나무 namu (‘tree’) and 잎 ip (‘leaf’), it surfaces as the insertion of geminated [n] between the two elements, which in the spelling is indicated by the in-between siot which combines with an unwritten ㄴ n as 나뭇-닢 namut-nip → 나문-닢 namun-nip. There are restrictions on when an in-between siot can be inserted in the spelling to mark the presence of sai-sori. When the first element already ends with a consonant coda, then the in-between siot cannot be added. Nor can it be added in most cases where the first element is Sino-Korean, save for some lexicalized exceptions like 숫자 數字 sutja [z̥ʰuːt.ʦʲa] (‘numeral’) from 수 數 su [z̥ʰuː] (‘number’) and 자 字 ja [ʣ̥ʲa] (‘letter’). 김밥 gimbap is the former case, where the first element 김 gim already ends with a consonant coda. Sai-sori indicates a genitive relationship between the two elements in the noun compound, but it is notoriously difficult to articulate the precise rules for its presence. There is no sai-sori in 나무집 namujip [na.mu.ʣʲip] (‘house made of wood’) whereas there is sai-sori in 나뭇집 namutjip [na.mut.ʦʲip] (‘house/store that sells wood’), both compound nouns made of 나무 namu [na.mu] (‘wood’) and 집 jip [ʣ̥ip] (‘house’). There are plenty of exceptions as well. 비빔밥 bibimbap [bi.bim.pap] (‘mixed rice’) has sai-sori, but not 볶음밥 bokkeumbap [bok.kɯm.bap] (‘fried rice’) does not, even though each construction refers to a method of preparing cooked rice. It would be futile to try to find a rule to explain the difference between the two. In compound nouns involving 밥 bap (‘cooked rice’), those where the first element refers to an incredient such as 쌀 ssal [sal] (‘rice’) or 계란 gyeran [ɡ̊je.ɾan] (‘egg’) usually do not have sai-sori, as can be seen in 쌀밥 ssalbap [sal.bap] (‘cooked white rice’) and 계란밥 gyeranbap [ɡ̊je.ɾan.bap] (‘egg rice’). So the traditional pronunciation without sai-sori in 김밥 gimbap follows this pattern. But the common pronunciation of 김밥 gimbap with sai-sori would seem to indicate that for these speakers, the relationship between 김 gim and 밥 bap is felt to be different from these previous cases. In recent years, the National Institute of the Korean Language has been taking a more descriptive approach and recognizing a number of widely used forms as standard, including 잎새 ipsae [ip.sɛ] (‘leaf’) and 이쁘다 ippeuda [iː.pɯ.da] (‘to be pretty’) which were previously considered non-standard variants of 잎사귀 ipsagwi [ip.sa.ɡy, -ɡɥi] and 예쁘다 yeppeuda [jeː.pɯ.da] respectively. The recognition of both pronunciations of 김밥 gimbap—[ɡ̊iːm.bap] and [ɡ̊iːm.pap]—as standard is another step in bringing the prescriptive language norms for Standard Korean a bit closer to common usage. The original Korean version of this post can be found here.